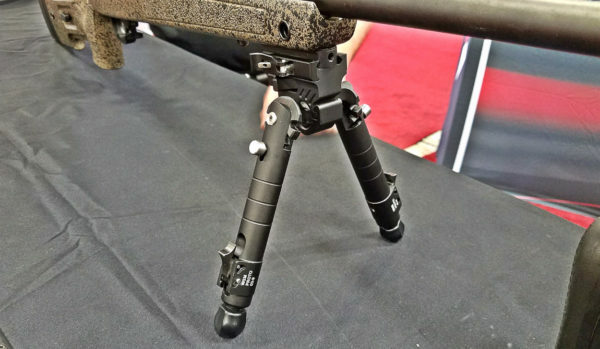 At the NASGW show in San Antonio, Warne Scope Mounts was showing off its first bipod. Hitting the market at some point in 2018, this high-end bipod looks to be strong competition with other units popular for precision rifle competition, hunting, and tactical use. Warne is packaging new, unique, and useful features into this bipod at a competitive price. In the video above, Justin from Warne walks us through the features and functionality of their newest product. Like most nice bipods leg angle is individually adjustable, locking very solidly via slots in a steel disk. Leg length is step adjustable in ratchet fashion, which is nothing new, but this Warne unit has tricks up its sleeve. Simply pull down on the foot and the leg extends. Click the locking lever inwards and the leg will shorten by a single notch. Click, click, click; three notches. Push the locking lever downwards towards the foot, however, and the leg retracts all the way up under spring power. Very cool. A thumb wheel on the back (shooter side) of the bipod’s QD mount controls tension on a ball joint. This allows for about 20 degrees of both panning and tilting and for locking it down at any location. The bipod’s feet are swappable, and Warne will be offering spikes and other styles. A locking lever QD mount will be included. MSRP is targeted at $250, which, yes, is a lot for a bipod but it’s quite competitive with Atlas and others in this space. Worth mentioning: it weighs a lot less than you’d guess by looking at it. Another slick product from Warne — one that’s available now — is their ANGLEYE rings. These 30mm or 34mm scope rings allow the user to adjust scope angle for long distance shooting. Dial in anywhere from 0 MOA to 90 MOA of elevation, greatly extending the capability of a scope’s internal adjustment without sacrificing the capacity to quickly re-adjust for non-extreme-long-range shots. They also ship with three height inserts so the same rings will work on different types of rifles with varying cheek rest heights. Also on the “coming soon” list, Warne will be manufacturing a rail-mounted, position-adjustable DOPE card holder. This provides long range shooters with a handy place to put ballistics data for various range and wind holdovers. Wow, really like the ANGLEYE product and the card holder. Bi-Pod is nice too (a little pricey for right now) wish this ‘item/technology’ ? could be transformed into a tri-pod for a spotting scope? I know most good-enough spotting scopes come with a good-enough to great tri-pod, but it’s not always the case, and (while most people are very careful with their scopes) sometimes the tri-pod suffers. I’m with Joe – the adjustable angle mounts seem like a great idea. Hopefully there’s some indexing and repeatability, so you could zero at one range, adjust to another known zero at some other range, and be able to return to the first range. The dope card holder is also pretty trick – much more room for data than on the inside of a flip up scope cap. Hmmm… may give Atlas a run for their money, which is saying a lot because I love my Atlas bipod. Dope card holder looks neat. They seem to definitely be stepping up their game, as their qd rings are “okay”, but LaRue stole my business on mounts for pretty much ever. More man jewelry. I’m not sure what this thing does that a Harris doesn’t do. I took a long range precision rifle class at Sig. There was a marine in the group with an AI Arctic Warfare rifle in .300 win mag with a Schmidt and Bender on top. Yes, he was embarrassing all of the rest of us. And guess what he saw fit to put a Harris on his $8000 rifle with its $6000 scope. So I think its good enough for my 700. It depends on what your use is. Static targets with little to no time constraints… no. In an environment where the targets are spread across the horizontal axis and time is a factor is a good use for this bipod. warne makes steel scope mounts. the additional weight is negligible to me. i prefer them. that bipod looks solid. something for the .308. Any word on a release date for the Bipod? Have a Christensen MPR on the way that needs some legs, and this fits the bill.